Shangri-La, Qaryat Al Beri, Abu Dhabi is a palatial hotel set in the tropics of modern day Arabia. 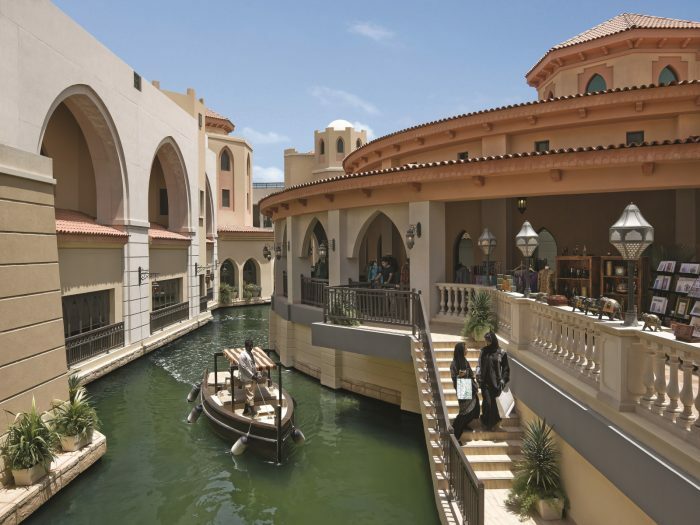 Lush gardens surround this hotel and there is no better way to explore the hotel than on an Arabian boat which meander through every corner of the hotel as you sit, stunned by the manicured gardens and souks. Each guestroom nestles you into regal comfort and all of a sudden, the riches of the property become real. Views of the canal, Arabic domes and minarets are intense, as the sun set lights up the sky and you enjoy this all from the comfort of your guestroom. The rooftop swimming pool is simply stunning and spending the day by the pool becomes one of the best pass times of any vacation. The CHI spa is a relaxing Arabian oasis which heightens the beauty of this property and every treatment is catered around the needs of each guest. For an authentic and cultured Arabian experience providing you with wonderful sights and an unforgettable place to rest your head, the Shangri-La, Qaryat Al Beri is divine. Lobby Lounge – Afternoon tea deserves a grand setting. A selection of teas from across the globe makes this a marvellous experience. Pearls Bar – this bar is elegant; as it floats above the great canal, guests will be in awe of not only the views but the extensive drinks menu. Pool Bar – Dining near the pool bar is a blissful time, but with views of the Sheikh Zayed Grand Mosque, guests will be mesmerised. The fitness classes make great, fun pass times; a lively and energetic atmosphere; try a zumba class or indoor cycling. The lap pool and the gym with its state of the art equipment is a well being discovery. Yoga rooms are the epitome and calmness, pilates, and the juice bar a wonderful aid in any wellness journey. This is an exotic retreat at Shangri-La. A serene atmosphere in the spa provides guests an opportunity to relax and revitalise and each antique treatment will encourage your well-being journey. For the ultimate pampering day, spend time in the Hair and Beauty Salon. The Sauna, Jacuzzi and Steam room are wonderful editions to the spa and evenings are spent relaxed. Children are kept thoroughly entertained at the children’s swimming pool and the baby sitting services give parents are well deserved break. Honeymoons are meant for intimate moments shared with a loved one and the Shangri-La, Qaryat Al Beri, Abu Dhabi, does just that. Set on a private beach with views of the canal, this hotel has been designed to stun guests with its Arabian architecture and decor and your own private hide away. Each guestroom is showered with untold luxury and comfortable retreats for their stay. Rich in texture and warm in colours, the lavish accommodation is well designed and spacious. Watching the sun rise from the comfort of your guestroom is impressive and a wonderful Arabian antidote. The CHI Spa offers extravagant couples’ treatments and your every sense comes alive as you unwind. Relax by the roof top pool or take in the sea breeze by the beach, you will be amazed by the tranquillity. Exploring the hotel on the Arabian boats is a fantastic way to see the property; the gentle breeze, the idyllic setting, the Arabian culture and the unparalleled beauty of this hotel. AL HANAH BAR- situated on the balcony; this will leave a lasting impression on any guest. International cuisine is served and be sure to savour every mouthful. Bord Eau – French fine dining is brought to life at this stylish restaurant. Fresh produce is flown in from France, to carefully create dishes that are as exquisite in taste, as they are beautiful to the eye. If guests are feeling courageous, the Blind tasting menu is seductive. Hoi An – Visit Hoi An to taste modern takes on traditional Vietnamese cuisine. Shang Palace – The Shangri–La’s signature restaurant serves mouth watering Cantonese dishes that every discerning guest will remember.